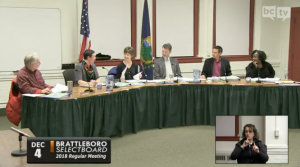 Read on for coverage of the Brattleboro Selectboard’s regular December 4th meeting. The mini-trial in the middle of the meeting regarding Dozer the Dangerous Dog took a turn when the owner made claims that it was not Dozer, but Buddy, her other dog. This led to much confusion in the courtroom. In more substantial and long term news, the Department of Public Works got the go-ahead to do a feasibility study to see what new facilities would entail. Nothing will be built anytime soon. 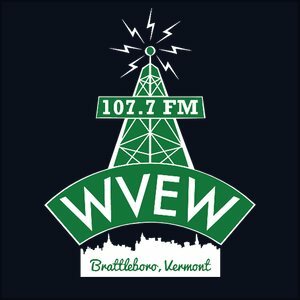 Kate O’Connor says the Brattleboro Museum and Art Center wants to possibly buy the train station where it is located. When something becomes viable, we’ll have a public discussion, and Representative Town Meeting would need to approve. Heads up! Peter Elwell says the Town will be trimming along the sidewalk plow route to remove hazards. Heads up! Brandie Starr said she and Tim Wessel went to see the celebrating recovery exhibit. Moving and frank. Not a lot of fluff. Some takeaway resources. Should be up for a short while, so go and look. Quite moving. Tim Wessel – It was sobering and inspiring. Also, BCTV bottom line is threatened. Important to our community. New FCC proposal, could decimate BCTV’s bottom line. Submit a comment to the FCC. Won’t affect initial decision, but will impact appeals if it goes thru. BCTV is over 20 years old. An incredible resource for us. $300k budget. Paid for by subscribers to cable. Kate – will be on agenda next week and will have a draft letter for the SB to send. Thanks for the great write-up, this meeting was a dozer. That dog is no buddy of mine! Steve Barrett, director of DPW – we hired Steve Horton to develop a scope of work and help advise. We got multiple bids. We like the Banwell Architects and SVE Engineering proposal for $20,000. Will pay for it partly with Utilities budget. Brandie Starr – why the low bid seemed better? We want to go as local as possible… why did price matter more? Barrett – sometimes there’s a big difference. We look at low bids, and look at local, but when the gap is greater we should go with the lower bid. Steve Horton also had experience with Banwell, and their ideas were good and well thought out. Not just low bid, but price is high consideration. David Schoales – the others are pretty good. Sometimes when a bid is low they forget something. Did they? Steve – not in this case. Sometimes that happens. They get a foot in the door. Hoping you like the low bid. This proposal has the same amount of work, they have experience, and was less expensive. Schoales – what does the engineering firm do? Steve – they’ll look at architect’s plan and look at the design, needs of water and sewer and electric. Architect will be more general. Engineer will do sound practices. They’ll look at existing facility, too. There could be some use for some of what we already have. They’ll evaluate our boilers, see if they can be re-used. Shanta Lee Gander – the timeline? Steve – we’ll get report in the spring. We just have money for the study now. Won’t be asking to build thing. Kate – is there money in Long Term Financial Plan? Elwell – we have plan for equipment but not facilities. This will help us figure out priorities for infrastructure. Need to get good studies done to make long term plans. Kate – now we’ll take money from the General Fund for this. $10k from General Fund. Steve – the new sidewalk tractor has arrived! Elwell – SB approved the artists to remove the temporary one and put in a new one. This document is a contract, and no Town funds will be used. Artists will collect the funds. We provide the location for the art. Also, the document now is similar to the one for the temporary installation. This is less complex, so it is simpler this time around. Shanta – what’s the maintenance cost? Elwell – the artists have to maintain it. It’s tricky. It’s permanent. There will a come when they aren’t around, so we agreed to reach out to them for as long as we’re able to stay connected with them. After that, Town can decide. Shanta – what if someone gets injured if a piece falls off and hurts someone? Who has liability? Elwell – artists. Anyone can sue anyone, but this gives us some protection. Town Atty Fisher – satisfies me! Kate – ‘artists shall supply town with maintenance list’? Elwell – we understand that to mean routine maintenance, like washing it down. Not restoration? Kate – someone might think we agreed to maintain it. Elwell – there’s #24 – Alteration – last known address to contact them if something needs to be done to it at the site, such as disrepair. Brandie – we hose it down and something falls down? Elwell – we can leave it for later. Our understanding is they will fix it and rehab it as long as we can contact them. Fisher – if Town wants to change it or something because of danger, then we have to contact them. But if we want to clean it, we don’t need to ask them. Elwell – like murals in town. Kate – murals don’t fall on people. Tim – if I was asked which agenda item would be easy, I would have thought it this one. Kate – if we hose it down and it falls, it’s a big thing. Elwell – little pieces attached to a big frame. While we maintain the facility, we’ll keep an eye on it. If we can’t locate them when there is a problem…we can fix it. Kate – if a big piece falls, is it Town liability? Kate – after it is installed, it is Town liability. Shanta – wouldn’t want artists to lose their shirt, either. David – this seems reasonable, and it seems unreasonable to make artists take liability. Dozer the Dangerous Dog Appeal - Courtroom Revelations, Twist, and Turns! Kate – Police Chief and Attorneys are here. Chief Fitzgerald – First I’ll explain what a dangerous animal is, and the considerations I took. I sent a letter to the owner saying the dog is dangerous. “Attacked, bitten, scratched another domestic pet or person…” a non-exclusive list includes rearing up, biting, attempting to chase, chasing. On Aug 4 an officer heard that a dog attacked a cat. Pit bull attacked her cat, said owner. She went to vet with cat – broken jaw, ribs, puncture wound – $4,000 bill, Cat died two days later. We’ve had several incidents with this dog. We responded to loose pit bull scaring children. Owner kept the dog on the property after giving a ticket. Ticket was dismissed after compliance. On Oct 17, a dog bite victim – the owner, inside the residence. No police investigation needed. Same dog. Aug 18 – killing of cat. Dog is up to date in vaccinations and license. We want to declare Dozer dangerous, as he has acted aggressively. Owner would need to keep animal in secure enclosure outside, muzzled when walked on leash, and get liability insurance on the animal for $50k. Kate – we decide if we sustain or overturn this decision. Owner Nina Kunimoto’s lawyer wanted to give their perspective. “We have testimony and exhibits.” Cute dog photos get handed to the board. She continues – she takes responsibility for the cat injury, but some distinctions. Owner has two dogs – Buddy and Dozer. Buddy is brown, Dozer is white. Dozer didn’t attack the cat, Buddy attacked the cat. Dozer not responsibile. Loose dog was Dozer, but dog bite was Buddy again. But, Buddy has been under better control since – rehab training, sent to NY, worked everyday with him. A dangerous dog, defined by police chief, he says aggressive can mean attempting to chase, or scratch. There is some discretion in deciding if jumping is dangerous. Owner was only witness to incident. Won’t happen in future. Nina – doctoral student in Boston and professor at Marlboro. I have two dogs. Both pit bulls. Got them as puppies. Adopted Dozer first. I know they have negative image. Dozer went through much training, went to day care, well socialized. We then got Buddy a year later. He didn’t get the same training. They are lively and active. – On Aug 4 I needed to go to first day of class and chose to walk down perpendicular to where I live – Valgar Street. Not a normal walk place for us. Needed a short walk. They were on leash and barking a lot. I assumed a squirrel nearby. Cat ran up to Buddy and Buddy bit down. Dozer was nosing the cat. I could let leashes go, or not. I was screaming for help to get Buddy off the cat. Then someone came out. I was frazzled to see this happening. No one else around. Told the guy who came out what happened. Reprimanded the dog. Lawyer – how certain are you that it was not Dozer? Lawyer – what did you do with the dogs? Nina – someone recommended a Newfane dog trainer – Kevin – he explained his model and took Buddy on. Buddy went for two weeks and I trained myself, read a book, watched videos, now use a slip collar/choke collar. Lawyer – how much experience? Where did you send Buddy? Nina – Mark is training with Kevin, who’s done this 50 years. Mark uses Kevin’s model, and they specialize in a strong prey drive. We redirected his energy. I got an hour with Mark and continue that training. We do exercises every day. I listen to the dog. We push. I let him jump on me. Much better. Lawyer – what will you do if Town labels him dangerous? Nina – one core exercise is about barking – which is a release. A muzzle will prevent it. Goal is for him to carry a large bite toy as he walks. Wouldn’t be able to continue his training. Kate – We’re talking about Dozer is a dangerous dog. Interesting to hear about Buddy, but not what we’re talking about. Lawyer – it wasn’t Dozer. We’d like to admit it is Buddy but don’t want him to become dangerous. Kate – if you have to come back…you have to come back. Shanta – there were other incidents listed. Fisher – you are here for Dozer, and we don’t know about Buddy. Perhaps that comes back for an appeal. SB gets to ask questions. Kate – finish up on Dozer. Lawyer – Dozer not the dog that bit the cat. One was loose dog and one was a bite. Nina – Dozer did get loose, he barked, and people were fearful, he didn’t hurt anyone, and never has hurt anyone. The dog bite was Buddy – he was scared of a crossing skateboard. Not Dozer. Lawyer – Dozer not involved. Tim – why didn’t you let us know earlier? Why did you wait. Lawyer – the ordinance is clear so we appealed. Tim – one is dangerous. Lawyer – Buddy is not dangerous today. But you don’t want to hear abut him. Brandie – Dozer has been warned on agenda. Lawyer – the Chief can tell us if Buddy will be declared dangerous. David- so no one else saw the cat get bit…. Chief Fitzgerald – First time I’m hearing it is Buddy. When animal control officer interviewed owner, Oct 3. Cathy Burrows went and spoke to owner. She says in report that the cat walked up and “Dozer grabbed the cat.” Yes, first time I’m hearing it was not Dozer, since Oct 3 report says owner said it was Dozer. Kate – was it the attack of the cat that caused the designation? Chief- This is the first time I’ve had to do this. Doing it for safety of community. Valgar St has children and pets. I want to beside the dog is under complete control with leash, and make sure it is muzzled so it can’t bit if it gets loose, and insurance in case there are more damages someday. Tim – so Cathy Barrows was wrong when she reported this? Nina – I didn’t explain – I was in a hurry when she gave me a citation. She asked me if she needed me to explain. I signed a paper. I never said that to her. I didn’t say anything, just signed citation. Explained the cat came out to the dog, but was in a hurry and didn’t need explanation. Shanta – you and husband walk Dozer and Buddy – and others walk them? Nina – yes, I have dog walkers. I travel all over. My husbands’ brother walks him sometimes. I have a harness, and muzzle the dog now. I muzzled Buddy, but Dozer is accused. So we muzzle Dozer, too. Shanta – someone bit inside your home? Nina – Buddy gets nervous around skateboards and bit me out of nervousness. Not in home. Out. Tim – this is for public safety. Sustaining Chief’s decision is for public safety. WE should sustain the declaration, but now we don’t know what dog it is. A cat is dead. Not sure trying can turn that around. David – if either one gets loose, the humans aren’t doing their part. My concern is you and your system for taking care of your dog. The dog can potentially do harm. Chief reviews the penalties for the board – keep in secure enclosure when outside in yard, when walked it must be muzzled and must be under constant and complete control, and must have 50k liability insurance . Brandie – one concern is that there is some bias about pit bulls. If declared dangerous, that animal can be put down for another incident, within 7 days. Brandie – concern about the bias at this table – if it were a different type of dog? Is there doggie probation to see how the training went? David – do we wait to see if it bites someone else? Fisher – options! Not anything for Buddy tonight. You are here for Dozer, and there is conflicting evidence. You need to weigh that evidence and decide to uphold or overturn. You deliberate in public, and you can take a recess and go into deliberative decision and come out with a decision. Shanta – how about character witnesses – anything with teeth – is it possible that there would be another hearing? Who can tell us about Dozer? Shanta – I’d like to see a range of witnesses to tell us about Dozer. Fisher – that’s an option. You could do it in several weeks. You have no control over a declaration of Buddy – You might combine them if that happens. Kate – next week is two soon, then the 18th, then Jan 8. What’s thrown me for a loop is hearing that it was Buddy not Dozer. We have incidents that Dozer has done. Tim – could Officer Washburn give an opinion? Buddy is brown and Dozer is white. Chief – the dog that bit the owner was described as a black and white dog. Sgt. Witherbee’s report says bit by a black and white dog. Never heard of Buddy before. I knew there were two dogs. Nina – I went to Urgent Care – no one asked me what the dog looked like. Not sure how that got in the report. Tim – you voluntarily muzzled Dozer. Nina – once I got the letter about him. Buddy was already muzzled. Tim – would you be willing to muzzle both until we figure this out? Nina – I’m happy to. Tim – there is confusion over which dog. Kate – we don’t make that designation. Police Chief has to make that decision. That’s usurping the Chief’s authority. Tonight’s decision is about the declaration about Dozer. Fisher – Buddy is not before you. Kate – decide or continue til Dec 18? Shanta – based on what’s in writing, my decision wouldn’t be favorable tonight. I’d love to see some witnesses who live in community. Brandie – I don’t want to do the 18th. Need to gather info. Kate – how about Jan 8. The decision is continued until Jan 8, with the hope the dogs continue with muzzles until that time. Kate – the person who came out after the cat bite wasn’t there when the cat was bit. (No) When Cathy Barrows identified it as Dozer…I’d like clarification of that. We may never clarify it, but would be helpful if we could. David – Dozer definitely barked at children when he ran away. Dozer lawyer – a first offense! Shanta – two potentially dangerous animals. Would be great to get more clarification. I don’t care about breed at all. Dozer Lawyer – things can be resolved with an agreement, rather than the official response. A muzzle isn’t a guarantee of a safe dog. Nina’s trying to create a safe dog. You can protect the public interest without the declaration – there can be an understanding and agreement. Tim – You muzzle only while walking, though. Couldn’t it be trained in enclosure without muzzle? Tim – my concern for the community is stronger than concern for your dog’s well being. Sorry. Chief – animal control officer said owner said Dozer went after the cat. Not sure what other evidence I can bring. Brandie – we’ll all go away and think about dif things, and meet again in 4 weeks. Adam Grinold and SeVEDS explain their programs and activities he Selectboard with their annual report. It’s pretty much what you’d expect, on the topic of Workforce Development. Jobs, youth, raise wages, partners, schools, innovative programs. They also ask for money from Selectboards and Town Meetings all over the region. $3 per capita is the request. Funds are important to help SeVEDS get more funds. Kate – this isn’t tax dollars, it is a grant. Last year we gave $2. Shanta – I’ve enjoyed you “creative black ties” but the challenge is diversity. Curious about how you partner with groups or break down barriers. How to make diversity strides? Adam – we explain diversity to employers. We need diversity. We take intentional steps. SeVEDS person – governance committee and steering committee will create a structure so we can increase our capacity. We want Young Professionals to partner with NAACP. Tim – huge fans of some of what you do and am skeptical of other parts. Every year I see these nice materials and see SeVEDS and BDCC co-mingling and I get confused. It’s confusing in communications. My skepticism is about communications and stretching too far to Bennington. Overall, what you do still seems a bit murky. On praise side, workforce development is going really well. Business assistance, too. Some straight up reactions. Adam – VT legislature designated a zone, and we did some two county work. Rare for one county to get approval to do a CEDS. Windham could do a single county because of VY. Working in two counties comes from the renewal process. We’ll get more funding with a two county CEDS. Two counties can bring our average income down to help us get funds we don’t usually get. Tim – kinda makes sense. What about Windsor Co? Adam – Windsor is in a multi county CEDS already. BDCC does programs and projects – SeVEDS does strategies. They are unique because SeVEDS started as a grassroots effort, and stays that way. Tim – really don’t like “Stay to Stay” It’s a program to invite people stay temporarily so they may stay for a lifetime. SeVEDS person – statewide program, Brattleboro and 3 other communities in a pilot – they sign up for weekend,get a welcome, meet community members, the guests do whatever for the weekend, then we meet up again and have them meet realtors, employers, etc. 10 people or so have moved to Vermont since the pilot program began this year. Tim – it is interpreted as turning away from people who are already here, and turning toward people who are away. A perception problem? Adam – we’ll share that with the state. Shanta – I did have a meeting to find out what you do, this presentation answered some long term questions for me. You should remind public of what you offer. Kate – the money you ask for goes to….? Adam – they are flexible funds. We can use it to help raise money from other organizations, fund workforce development. It goes to SeVEDS, not BDCC. SeVEDS contracts with BDCC to enact strategic priorities. David – 4th or 5th year of hearing this, and see progress. I know the challenges. Glad you encourage new people in the trades. I’d love it if you had a job board, and if you’d focus more on local folks staying here. We need tradespeople. If money came from General Fund I wouldn’t support it. Our resources need to go service organ. Brandie – who do you work for? Adam – we work with lots of organizations. We’re a member of an ad-hoc group. Tim – instead of Stay to Stay – why not turn around the story of kids moving off to the city. Come back to home. Brandie – a fish ’em back program? Adam – we can search LinkedIn, and tell people to come back to Vermont. SeVEDS is thanked and their request will be considered, and decided upon at a later time. Pay attention, if your tax rate matters to you. Elwell says both are in transition, with reduced staffing and expenses, and increased contracted services. Town Attorney Fisher has an update on Vehicles for Hire. Fisher – we had a proposed ordinance, but board heard criticism at public hearing regarding how it was written. At second reading, taxi companies complained. Good feedback. Board held off. State was going to report in, too. Study is underway as to whether state should regulate, and what towns currently do. Taxi companies suggested recent state law not strong enough, dif from what you heard here. Transportation networks like Uber, they feel, should have more insurance, and checks. We were hearing local taxi companies have cars they hire out for special needs…. Schoales – all legislative bills are due Jan 15, doesn’t mean they will consider this at all. A local ordinance could help. Are requirements same for Uber and taxi? They won’t duplicate efforts for Brattleboro? Fisher – in terms of record checks, yes. We want to know that vehicle for hire is working in our community. Yes. Board decides to venture forward without waiting for state. Fisher – we’ll come back with a report, then you can schedule hearings. We’ll want to work on application forms and other things. Community Justice Center is applying for $5,000 from Thomas Thompson Trust, to share with partners on related projects. BASIC is applying for an $85,000 grant from the state dept of Forests, Parks and Recreation. If they get it, they’ll spend it on skatepark construction. Jeff Clark says there were two great design meetings. People brainstormed what they’d like to see, designers took that then presented two proposals and features. Then came back with a proposal. Stantec gave us preliminary conservative numbers – we need to apply for grant up to $85. Numbers are pretty high compared to what we have. We’re reviewing those numbers, and we’ll pull out things that aren’t needed, and will reach out to community to explain the real numbers of the project. We’d like in-kind-donations from the community. Carol Lolatte confirms they are trimming and cutting the plans back, but want the ability to get the grant if needed. Jeff – this is where we sit. Tony Hawk foundation said under $50 a sq ft, Stantec is up to $70. David – optimistic about the grant? Carol – you never know. There’s $100k to spread around. So we won’t get $85k. Maybe $30-35k. Tim – disappointing to town and town meeting reps. Did you tell Tony Hawk the numbers were higher? Carol – there needs to be a middle point where experts and builders have the same numbers per sq ft.
Franz – what’s the shortfall at this point?